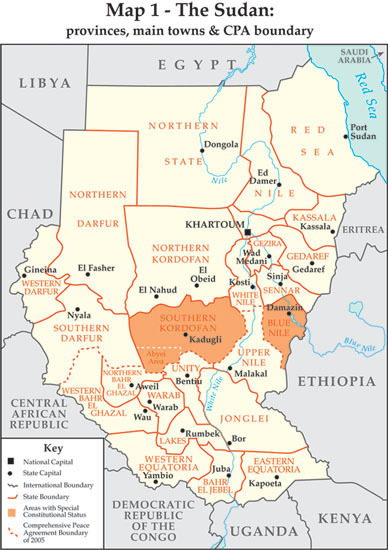 This map shows the provinces of the Sudan, the boundary defining the north and south in the Comprehensive Peace Agreement of 2005, and the three areas of Abyei, Southern Kordofan and Blue Nile which lie north of the line but for which special constitutional provisions have been made. 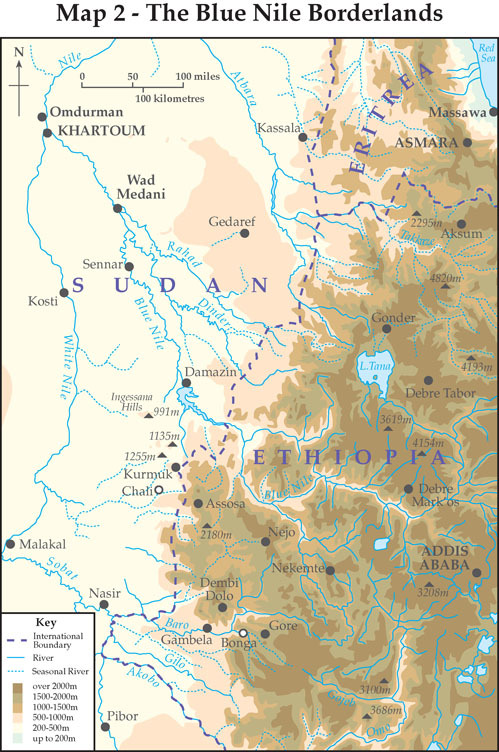 Over history people have repeatedly found refuge in the rugged mountains and deep valleys where western Ethiopia meets the eastern fringes of the Sudan. The map shows Chali, the Sudanese village near Kurmuk which was the centre of Uduk country up to 1987, and also Bonga, the refugee settlement near Gambela in Ethiopia where they arrived in 1993. In the course of trekking, they had found themselves as far west as Nor Deng, near Nasir in the Upper Nile. Allen, Tim (ed. ): In search of Cool Ground: War, Flight and Homecoming in Northeast Africa. London: James Currey, 1996. Banks, Marcus and Howard Morphy (eds. ): Rethinking Visual Anthropology. New Haven and London: Yale University Press, 1997. Connerton, Paul: How Societies Remember. Cambridge: Cambridge University Press, 1989. James, Wendy: ’Kwanim Pa: the Making of the Uduk People. An Ethnographic Study of Survival in the Sudan-Ethiopian borderlands. Oxford: Clarendon Press, 1979. James, Wendy: The Listening Ebony: Moral Knowledge, Religion and Power amongst the Uduk of Sudan. Oxford: Clarendon Press, 1988 (paperback1999). Johnson, Douglas H.: The Root Causes of Sudan’s Civil Wars. Oxford & Bloomington IN: James Currey/Indiana University Press, updated 2006. Stokes, Martin (ed. ): Ethnicity, Identity and Music: The Musical Construction of Place. Oxford & New York: Berg, 1994. Wilson, Thomas and Hastings Donnan (eds. ): Border Identities: Nation and State at International Frontiers. Cambridge: Cambridge University Press, 1998.